This species is accepted, and its native range is Temp. Eurasia. It is used to treat unspecified medicinal disorders. Naturalizada y adventicia en Colombia; Alt. 300 - 3900 m.; Andes, Llanura del Caribe. Type from Europe. Type from Europe. Nut light brown, (1)1.2–1.5(1.7) × 0.8–1.2(1.5) mm, sharply trigonous, ± wrinkled and papillose. 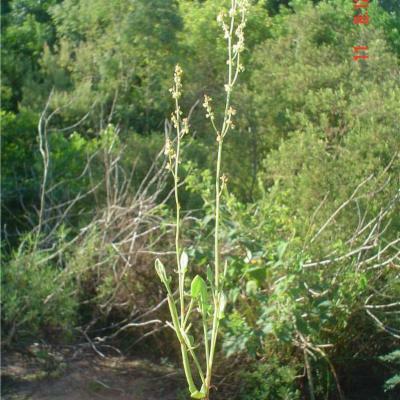 Common weed in cultivated lands, grasslands, in wet places and sandy banks of watercourses; 1500–2000 m.
Wild (1955) notes as of importance as a weed only in the eastern border region of Zimbabwe. Subsp. angiocarpus is recognized by its mature inner perianth segments joined to the nut. This character is ± conspicuous in all the female specimens examined, except Fries, Norlindh & Weimarck 3463 (K) from Nyangani Mt., in which the segments are not clearly adnate. A slender perennial, with erect or decumbent stems, seldom exceeding 30 cm. tall, arising from a basal tuft of leaves. Ocreae hyaline, 4–5 mm. long, readily tearing. Leaves long-petioled, hastate, often narrowly so, apically subacute, basally decurrent; the terminal lobe seldom exceeding 4 cm. in length; basal lobes much shorter, narrow, spreading outward and often turning forward; immature leaves often unlobed, linear. Inflorescence slender, paniculate, much-branched, leafless; the flowers borne in close fascicles up to 5 mm. apart. Male flowers 2–2.5 mm. across, the outer tepals oblong-lanceolate, partly appressed to the inner; inner tepals greenish-brown becoming tinged with red. Anthers yellow, 1 mm. long, longer than the filaments. Inner tepals of ♀ flowers closely appressed to and accrescent with the nut; outer tepals small, lanceolate. Male flowers 2–2.5 mm. across, the outer tepals oblong-lanceolate, partly appressed to the inner; inner tepals greenish-brown becoming tinged with red. Anthers yellow, 1 mm. long, longer than the filaments. Inner tepals of ♀ flowers closely appressed to and accrescent with the nut; outer tepals small, lanceolate. Nut light brown, sharply trigonous, ± 1 mm. long and approximately as broad. 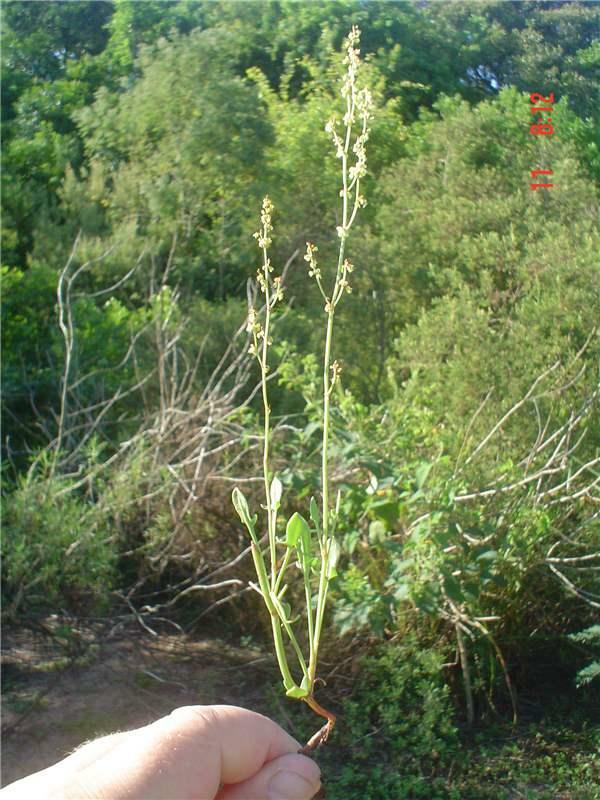 A weed in experimental grass plots; 2400 m.
Introduced and naturalised in Colombia. Alt. 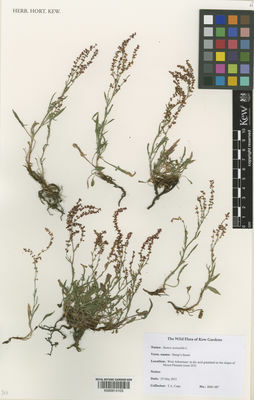 300 - 3900 m.
Rumex falcarius Willd. ex Ledeb. Hammel, B.E., Grayum, M.H., Herrera, C. & Zamora, N. (eds.) (2014). Manual de Plantas de Costa Rica 7: 1-840. Missouri Botanical Garden Press. Akeroyd, J.R. (2013). Docks and Knotweeds of Britain and Ireland: 1-258. Botanical Society of Britain and Ireland. Tupitsyna, N.N. (2012). Revision of Polygonaceae Juss. in the flora of southern part of Krasnoyarsk region Turczaninowia 15(2): 44-48. Saldivia, P. & Rojas, G. (2008). Nuevos registros y antecedentes de la familia Cactaceae para Chile en la region de Aisen Gayana. Botánica 65: 198-208. Gremmen, N.J.M. (1982). The vegetation of the Subantarctic islands Marion and Prince Edward: 1-149. Dr W. Junk publishers. The Hague, Boston, London. Graham, R.A. (1958). Flora of Tropical East Africa, Polygonaceae: 1-40. Feddes Repert. 95: 54 (1984). Burtt Davy, Fl. Pl. Ferns Transvaal, part 1: 171, fig. 17 (1926). F.C. 5, 1: 475 (1912). Bot. Not. 1899: 41 (1899). C. H. Wright in Fl. Cap. 5 (1): 475 (1912). L., Sp. Pl. : 338 (1753).